Carrying your baby is such a personal thing – people carry for different reasons and different carriers suit different people. Here is Fiona’s story…. “My baby wearing journey resulted mainly from living in a flat above a city center restaurant. What had been an appropriate dwelling pre-baby was going to be tricky with a child, especially with the 39 metal steps (yes I counted them!) to the front door. At six months pregnant I was at a NCT nearly new sale when a store holder thrust a Babybjorn at me and told me I needed it. Around this time I also picked up a stretchy wrap from TK Maxx. I took it out of the box and tangled it around our living room completely bemused. Three YouTube videos later, I decided it would be like tying a karate belt and slung it on. When baby did arrive – somewhat early and very tiny – I took the stretchy out again and the baby disappeared into the folds. I was dismayed. I fished her out and tried again few weeks later. My other half looked at the stretchy with trepidation and asked me to use the Babybjorn – “it’s safer” he thought. I preserved with the stretchy and was rewarded with a better result, but it was THICK jersey and a hot summer. We sweltered. Few new baby friends would visit as my flat was inaccessible so the sling was invaluable as I trekked round the borough on public transport- as nothing is more frustrating than waiting for a bus to not be able to get on due to lack of pram space. This never happens with a sling. The sling allowed me to be mobile and leave the flat. By the autumn – I was still using the stretchy but my back was beginning to ache. I found an ad for Boba 3G online and spent the last of my maternity pay. It was fantastic. We chose it as it would fit both large and smaller wearers. It also went up to 45 lbs and I wanted a sling that would last. I put baby on my back and would go shopping with ease. No more lugging the 10 kilo pram up all those stairs. I also invested in a pouch sling when baby was eight months old – for easy ups and downs and this was especially helpful when trying to carry a buggy up tube stairs – where helpful fellow commuters were thin on the ground. 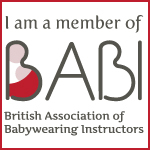 FAQ – How do you neatly fold up a buckle carrier?